If you are in search of good know-hows concerning coloring hair at home, and at the same time are a bit unsure with experimenting, then we have a very good solution for you. Actually, it’s not that hard as it seems, and apart from saving time and money, you can also develop your styling skills, following the great step-by-step guide on how to color hair at home presented below. After fetching all these tools, you may pass to the dyeing process. Be sure not to start dyeing your hair immediately after washing it, since being not freshly washed hair is covered with special protective layers that prevent it from getting broken or damaged. Also put the button-down shirt we mentioned in the list, and it’s more preferable to pick one that is not your all-time fav, so that you don’t get too upset when having color stains on it when finished. Despite being excited and impatient to pass immediately to dyeing, you should first carry out a test to find out whether the color you’ve chosen is exactly what you need or not. For that, you need to mix the color cream and the developer cream in a plastic bowl, pick a strand from behind your ear and apply the color to the whole of it, wrap the strand in foil and let it stay for 30 minutes approximately. You may also check the tone out and perhaps decide on the amount of time you need to keep the color on. After this, you need to rinse the strand and check the tone you’ve got with a white paper as background in order to see the shade clearly and to make sure it’s exactly what you wanted. If so, you are ready for the next step. First take some steps for protection. For that, you need to rub the petroleum jelly around hairline to avoid the skin strains. If any dye gets on your skin, quickly wipe it off with a facial wipe. Mix the creams in a special bottle and shake well to make them get mixed (this should take about 20 seconds). According to the length and thickness of your hair, divide it up into 4 sections and fasten with the hair clips. Start applying the color from top to the shaft, in case you want some grey hair to cover. 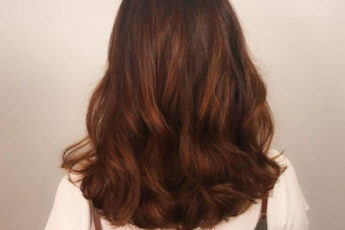 If not, start with mid-lengths and tips first and move to the top for shifts towards lighter tones. Let the dye stay on hair for 30 minutes or according to the time you’ve set with your test, and after done, wash your hair with warm water until clean. Dry your hair gently and use a large toothcomb for detangling. Finally apply the nearly quarter of your hair conditioner to newly dried hair and rinse off with warm water. For a long lasting effect you need to avoid washing hair every day, and also it is highly recommended using a color-care conditioner for maintaining the color ever longer.